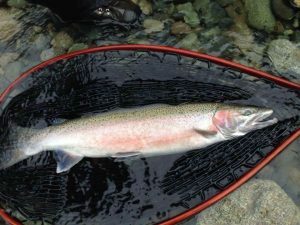 There are many ways to target winter steelhead here in B.C. Popular techniques include drift fishing with float rods, bottom bouncing, casting and swinging spoons, spey fishing, and—although not as popular in Canada as it is to the south of us—side drifting. 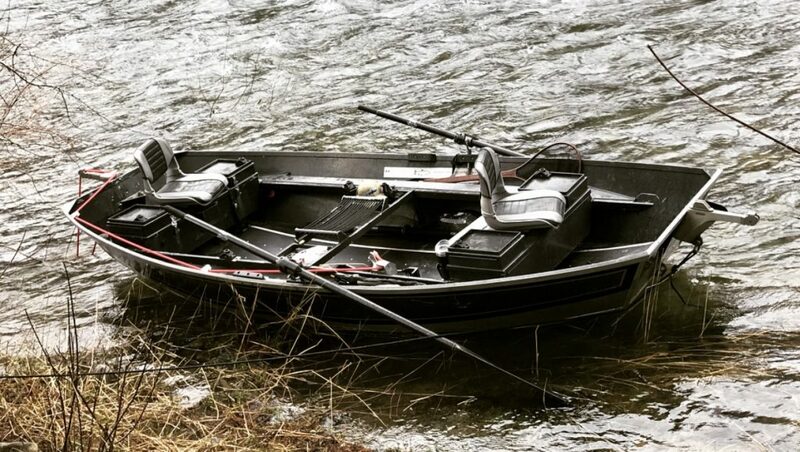 In this piece, I’m going to cover the basics when fishing out of a drift boat on a medium sized river with centrepin tackle. As a guide I’m always trying to put my clients into the best water that is likely holding a steelhead. Winter water conditions play a huge role on where these steelhead will hold. Low and clear water will have fish holding in much faster water than one might expect. Downsizing in tackle usually helps, I like 8mm trout beads or any of the many soft single eggs available, tied to 8-10lb test line. Medium flow (ideal height) can have fish holding just off the seams of main currents, along logs, in tail outs, behind boulders, outlets of side channels, etc. 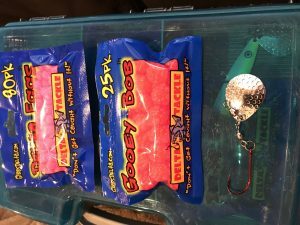 gooey bobs, 3-4” pink worms, jigs, and 10-12mm trout beads all have their days. Then there is high water. Every season we have a couple high water events that can totally change the river and the spots fish hold throughout a river system. When fishing during high, sometimes dark/muddy water, stay close to the bank, fish the slowest spots that are almost completely out of the current. Large pink worms and gooey bobs are usually my choice in high water. As I’m rowing the drift boat down river I always make sure I look well head for any dangers, after a high-water event logs can shift and entire trees can be moved to areas that on a previous drift may have been clear. Always scout ahead or contact other friends that have been drifting the river as well. It is good to have a circle of friends that you can trust to pass on information to each other regarding any possible dangers. 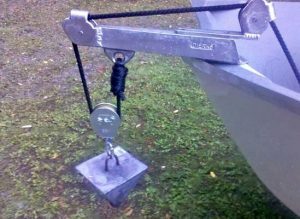 Another thing that is very important is where to properly anchor a drift boat so that you can fish out of it in a safe manner. When I pick a spot to drop anchor I like to have some sort of current break or have current slower than the main flow of water. I like an anchor from 40-50 lbs. 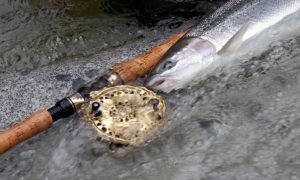 Avoid dragging your anchor at all costs—this can have bad effects on salmon or steelhead eggs that are in the gravel, and we want to give those eggs every chance they can get to hatch and return as adult fish. Do not anchor in very fast water, if your anchor gets stuck you may not be able to get it back and will have to cut your line, fast water is also very risky if you have to deal with a stuck anchor. Deep slow pools can have large rocks in the bottom, these can also trap an anchor and make it almost impossible to get back. I learned this on my first drift on the Stamp River. I had to cut my rope, this resulted in not being able to fish very well the rest of the day, now I know! When fishing a river with float gear you will come across two main types of set ups, centrepin rods and reels, and level wind reels on float rods. Ideal lengths for these include rods in the 10-12 foot range, even though out in the Great Lakes area many prefer even longer rods to 16 feet in order to downsize line diameter for picky fish. Centrepin reels are in the 4-5” diameters range and include Islanders very own and well-known Steelheader series. For my float rods I prefer a slower action rod that loads well to cast, I like the Sage 3113M or L blanks. If anyone would like more detailed information regarding any of the above topics feel free to contact me. Nelson is a year round guide on British Columbia’s Vancouver Island. In the winter you can find him on the rivers like the Nitnat and Cowichan where he hosts trout and steelhead anglers while in the summer he stays busy on the saltchuck guiding for salmon and halibut out of Port Renfrew, BC. This entry was posted in Expert Advice and tagged Nelson Karger. Having only fished the West Coast for steelhead I can try and help you with your question. When we get sub zero conditions here, I find a lot of the time it doesn’t pay to get on the water early. Take your time and fish 10-2pm if you have that option. I find fish to be sluggish when it’s very cold out. Light leaders and small offerings usually work for me here. As for what type of water they sit in, our winter run steelhead here like a fairly quick aearated, pocket water, along seams and especially if there’s a drop off with fast water above. Hope this helps!